The thing about Thanksgiving is that when the dishes are done and the last stray family member has been gently coaxed out the door, there are always leftovers. I’m talking about two kinds of leftovers, one good, one bad. The food leftovers are the wonderful ones: almost better than Thanksgiving itself is a perfect Thanksgiving leftovers sandwich with roast turkey, stuffing, and cranberry sauce inside. But the leftovers you’re sad to find in the kitchen? The half-empty wine bottles that collected on the table and in corners. Whether you’re opening a new wine for each course, or pleasing everyone with one white and one red, you’re bound to have a couple of strays lingering in corners, unnoticed until after the guests have left. Throwing out this kind of Thanksgiving leftovers would be sacrilegious to any true oenophile. But what to do? They’ll go bad before you can finish them off. Meet the WineKeeper, a wonderful invention for wine lovers all year round, but especially useful for the adult version of Thanksgiving leftovers. replacing the oxygen in the top of an opened bottle (which is what speeds up the aging process–too much exposure causes the wine to spoil), with nitrogen gas, which doesn’t react with the wine. 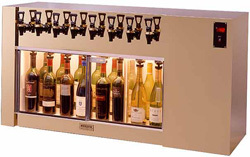 The bottle is hooked up to a tap, so that you can easily pour yourself (or a guest) a fresh glass whenever you please. 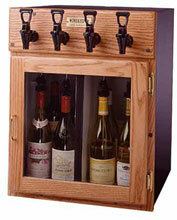 The WineKeeper is a great product for wine lovers, because it allows you to keep open several bottles at once. Say you and your spouse feel like drinking different wines, or you’re hosting a small dinner party in which you show off your expertise by matching the perfect wine to each course. 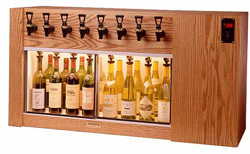 A wine preservation system allows you to keep several bottles open at once without ever worrying that your hard-earned investment will end up down the drain. 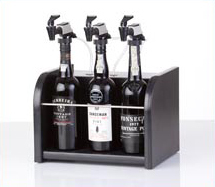 If there’s a wine collector in your family, you might also consider a WineKeeper for a fabulous Christmas present. Bonus: no wine will be wasted this Christmas dinner!